Located opposite the Swedish Institut and by the Musee Carnavalet, this small and pretty square has hidden treasures, a 17th century statue and a far more modern one from the 1990s that makes the sound of a nightingale bird with the wind. This small park and garden was designed in 1923 and inaugurated in 1931 with the name of Square Georges Cain, as it is dedicated to a former curator of the Musee Carnavalet, which is located very close by. 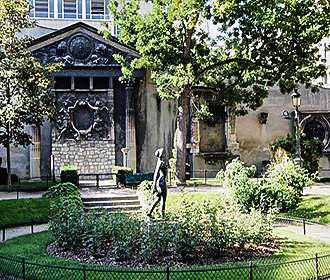 This small square in Paris has been used for many years as an archaeological repository for different fragments of buildings that have since been destroyed, and you can discover some unusual hidden treasures, some of which are partially hidden by curtains of ivy, such as old columns and bits of facades from the former Tuileries Palace and the original Hotel de Ville City Hall in Paris. And although the Square Georges Cain is a very little known garden, it is a tranquil place to have a picnic or relax on the grass on a nice summers day away from the hustle and bustle of city life, yet it is close to other tourist attractions in Paris such as the Institut Suedois or Swedish Institute with its museum. It is also very close to the Musee Carnavalet, which retraces the history of Paris, and being within the Marais area with numerous historical buildings, it is quite apt to find that there is also a statue dating from the 17th century. And surrounded by a bed of roses, this was sculpted by Laurent Magnier, who also produced numerous embellishments for the impressive Chateau Versailles. Yet there is also a far more modern monument located within the Square Georges Cain, which is called the Rossignol de Heinz, that translates to the Nightingale of Heinz, and is an electronic fantasy piece that was created by Erik Samakh in 1990. And located right at the entrance to this garden in Paris, when the wind blows you can hear the song of the nightingale bird. As we have mentioned, the Square Goerges Cain is located within the Marais area of Paris in the 3rd Arrondissement and it is open from 9am through to 8.30pm daily, however, we would like to point out that some parts of the garden such as the central area are not accessible to the disabled. But if you are in the area and want an unusual, yet calm and relaxing place to visit, then this is easy to get to via the Metro on the Saint-Paul stop via line 1 or the Chemin Vert stop via line 8.